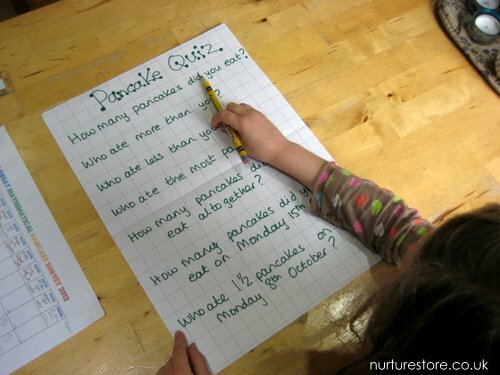 This set of pancake maths activities combines counting, measuring, graphing and estimating in a hands-on, real-life math adventure that starts off with eating pancakes! 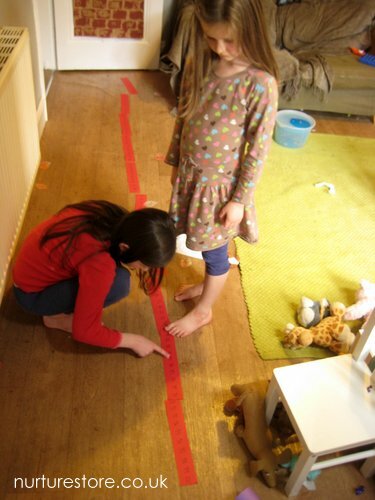 It’s a super fun math idea you can try at home, and is an especially good activity for children who don’t like math. The very best bit came first: eating pancakes! We used this perfect pancake recipe and the children helped out counting eggs, weighing flour and measuring milk. Every time we had pancakes for breakfast we recorded how many we ate on a simple chart that we kept on the door of the fridge. This let us learn about dates and days of the week, use the columns and rows of a table and record our data. 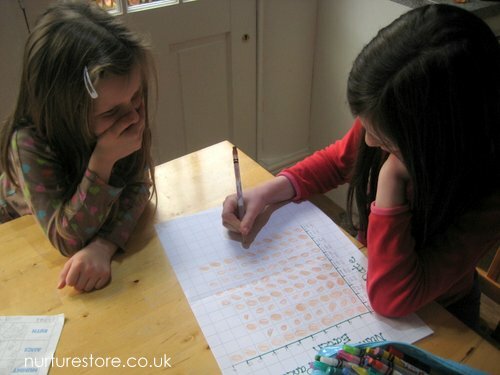 Little sister worked on writing her numbers correctly, big sister worked estimating how many pancakes were being eaten and the average eaten each day. 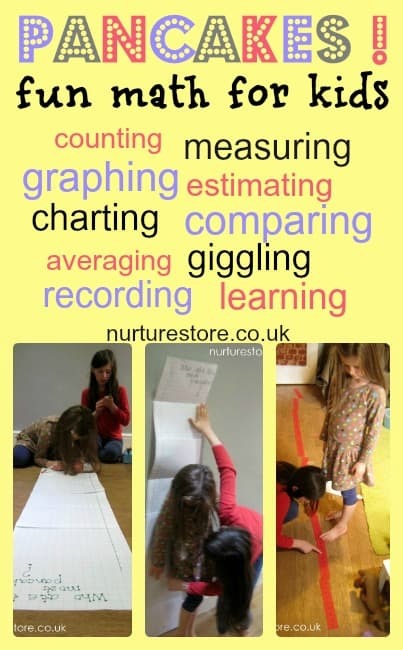 Once we’d completed our Great Mathematical Pancake Survey of 2012 we used our results to add in lots of fun maths activities. First up – a quiz. We looked at the concepts of more than, less than, addition, fractions and interpreting the data in our chart. 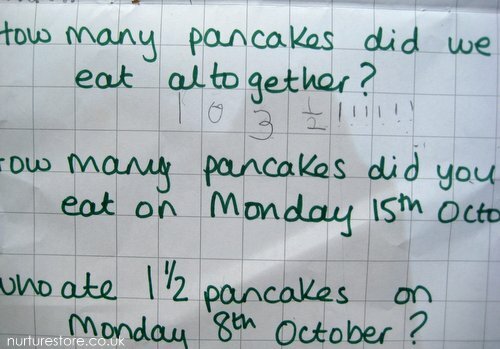 But the thing the children really wanted to know was how many pancakes we’d eaten all together! And boy did we eat a lot! Then we did some graphing, manipulating data from our first chart. We added up how many pancakes we’d eaten on each day of our survey. L’s laughing at how many B ate. 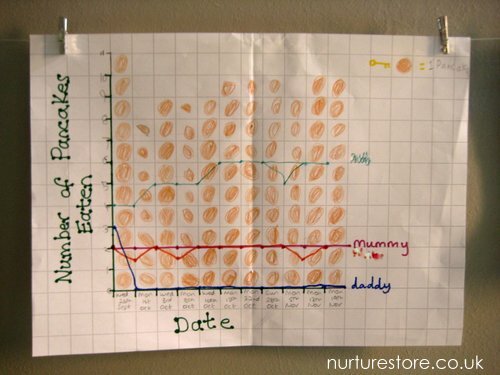 To extend things a little for big sister, we also represented the results in a line graph and she added a key. 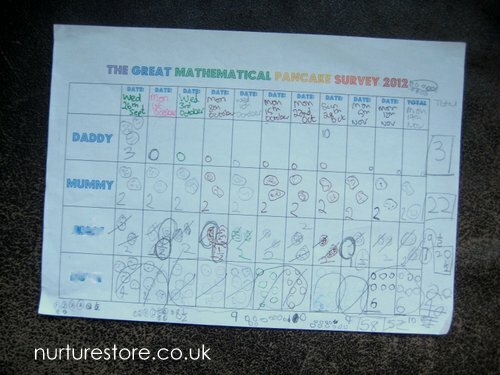 And finally we also used our original table to work out how many pancakes each member of the family had eaten in total. 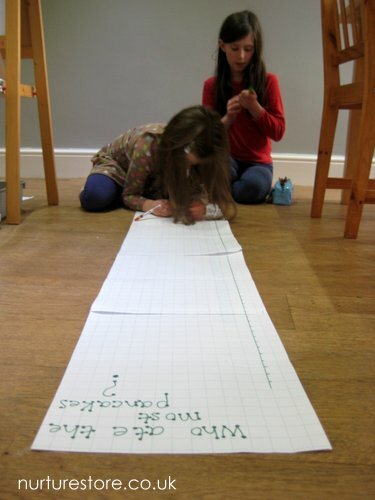 We made this into a bar chart – and it was long! 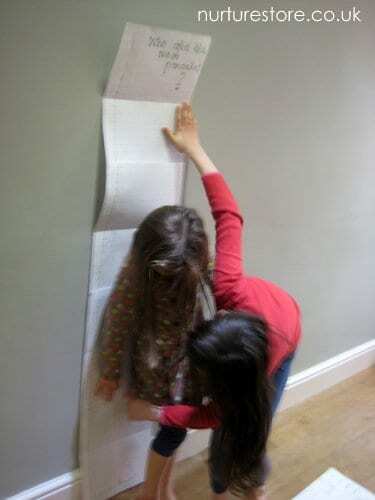 For some fun comparison at the end we wondered if we’d eaten more pancakes that our own height – and one of us had! You can find our full index of math activities here. This is wonderful. 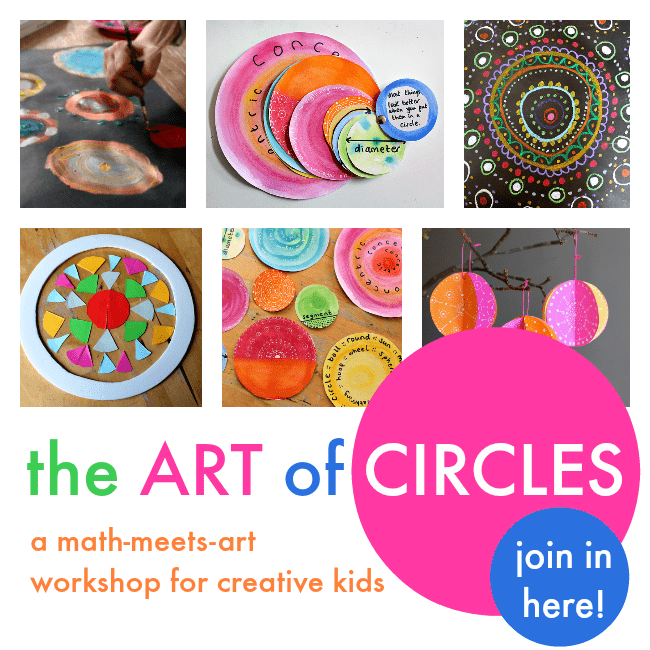 What an engaging way to teach math! You could also include Tomie dePaola’s book Pancakes for Supper and extend it into literature activities. Thanks for the book recommendation Shaunna, it’ll have to take a look at that. Ooh, I’m confused – did I mention Pancakes for Supper?